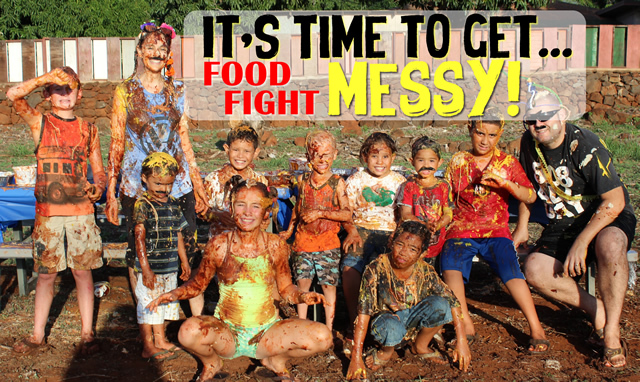 If you’ve been hanging around here for a while, then you already know what’s about to go down… It’s gonna be big… It’s gonna get messy… It’s gonna stain some clothes… It’s our annual FOOD FIGHT! What started out several years ago as our family’s silly alternative to Halloween, has turned into a fun event among neighbors and friends. At this point, I have no idea how many people will show up this year, but it doesn’t matter, we’re ready! I even ordered 20 sets of these science goggles in anticipation of getting smacked in the face with some serious food. 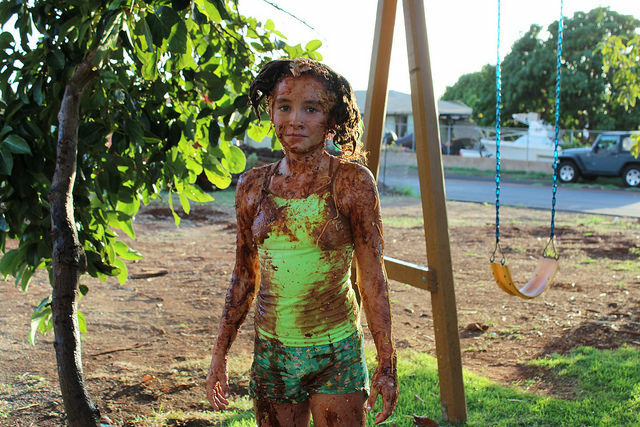 Last year, the kids had it in for me and attacked me with Mustard & Mayo mixed with cold lime Jello right to the face… most of it got in my mouth and I won’t lie, I dry heaved! LOL! It wasn’t pretty, but I recovered and vowed to ban the condiments this year! 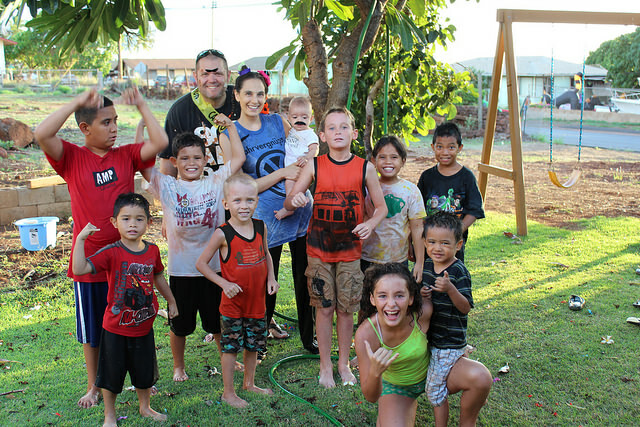 We end everything with a good hose down & then a HUGE water balloon fight… Last year we filled hundreds of water balloons in advance and it was so much fun! We send out this invitation a couple weeks in advance. 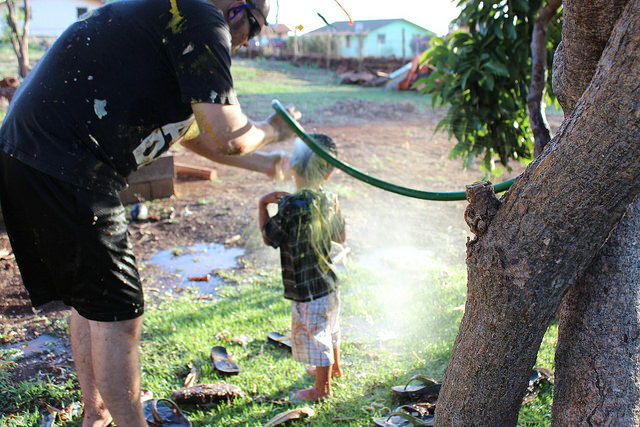 If your backyard is too small, consider a park or field where it’s ok to get messy – just remember you’ll need somewhere to wash off a bit when you’re done. Buy the Cheapest, Non-Organic, Food you can find… This is the time to use those coupons & buy in bulk! We also buy a bunch of fake mustaches to break the ice and get things silly… seriously, try not to laugh with one of those on! And don’t forget the water balloons if you’re going to do that afterwards. Buy food that’s easy to prepare, but that’s also messy… See the list of suggested foods in the invitation above. However, stay away from Spicy foods or Condiments (like mustard or chili) which can burn eyes and skin. 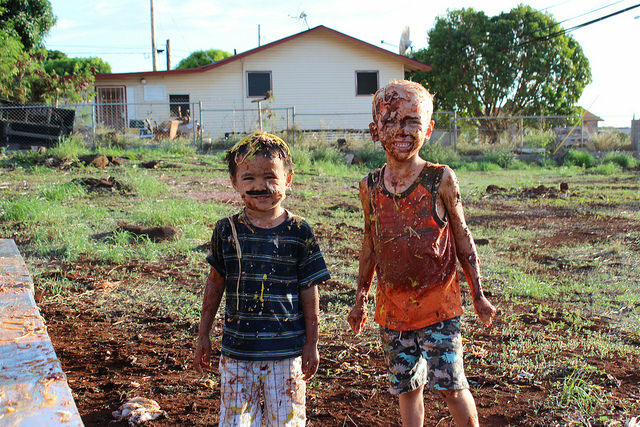 Encourage others to bring things to throw… the more the messier! Mandate goggles or eye protection of some sort and keep some rags handy for when you can’t see. We bought these for everyone this year… Trust me on this one! Move your table as far away from the house as possible & wrap the table/chairs in tablecloths or plastic wrap… this will make clean-up SOOOOO much easier. State the rule’s upfront, but be prepared for some of them not to be followed…. Like no throwing food in your little brothers face (yea right!). But, we do enforce the No Bully or Hurtful Contact rule. We also don’t allow people to grab the whole dish of food at once – only a fistful at a time! Designate a ‘clean person’ – someone who can take pictures; handout rags; help wipe eyes; stop you mid way through for a group shot; enforce the rules; and watch the really little guys if you have them. This year, we’re also going to set-up a little person table for all our kiddos under 3 with finger foods and squishy things to play with. Keep a hose nearby for washing off outside. Be sure to rinse off the clothes from all food particles before throwing them in the washer. Set-up a camera on a tripod (Go-Pros work great), and watch it back slow motion! Keep it short. We typically keep the whole event at about an hour. 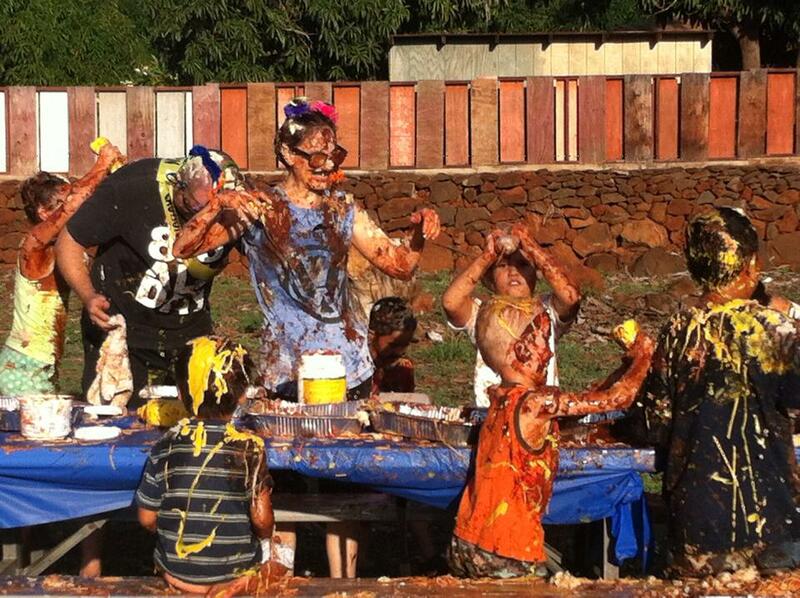 We spend about 30 minutes on the actual food fight & then about 20 minutes throwing water balloons at each other. And finally about 10 minutes to hose off. Once the kids leave, we all pitch in for a quick clean-up & head inside for the rest of our family fun (dinner, movie, treats & whole family living room slumber party!). If you know me at all, then you already know how I love everything clean, neat & organized. But, I also believe you got to play hard & let your hair down every now and then… It’s soooo good for the soul! I hope you’ll give it a try with your family this year… Trust me, no one will every forget it!! Thanks so much for posting all these details! 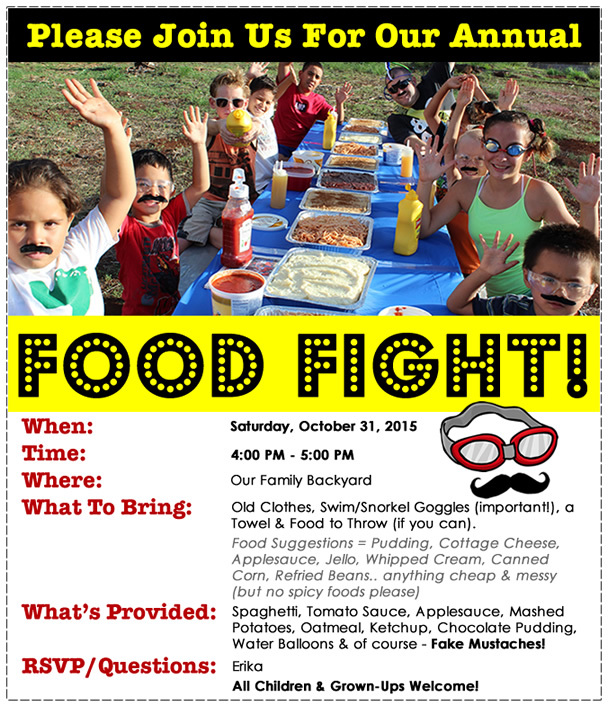 I’ve been dreaming about having a food fight for several years, and am about to take the plunge with my 16-year-old’s birthday party. Your post gave me so many great ideas to make the party a success! Ho Erika, I must say you really inspired me.It’s my wish for a very long time to get involved into a big food fight. Thank you for all the Ideas and Tips. I hope in summer we gonna have some fun and get messy. Isnt it important to be achild once in a while? There are so many boring people! I hope I’ll find a lot of friends and family who will join me to messy. I cant wait…..